You've got cats or dogs - and now you've got fleas. Liquid once-a-month topical medications can help get a flea infestation under control. You've got kids, too. How do you go about flea removal without harming the kids? Pests like fleas are not only a nuisance, but their bites can cause irritation and even serious allergies in some people. What can you do to beat the buggers? These less toxic flea removal methods will have your home (and your pets) itch free in no time. Comb constantly: Groom your cat or dog with a metal flea comb. Focus your efforts on the neck and tail area. Keep a bowl of hot soapy water nearby to drown the captured critters (ruthless enemies call for ruthless treatment). Until a flea infestation is under control, bathe dogs daily using shampoo or dog soap (insecticide not required). It's the best way to get fleas under control larger animals. Take the comb into the bath for an extra measure of flea catching-and-killing. Launder washable pet bedding in hot water and bleach at least weekly. Think (and apply) topically. Topical flea removal treatments, such as fipronil and imidacloprid can be applied to an animal's skin in small amounts while wearing gloves. From there, it spreads over the entire body of the pet and is effective for at least a month. Treat carpets, pet bedding and other non-washables with less-toxic flea removal products. 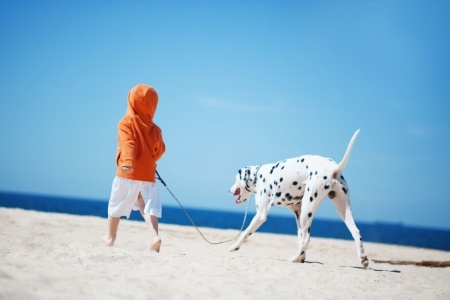 Sprinkle diatomaceous earth (DE) powder on carpets, upholstered furniture and pet bedding. DE has little toxicity to humans and animals, but kills pests handily by absorbing the waxy coating on their bodies, causing dehydration and death. To use, don a dust mask and sprinkle diatomaceous earth (DE) on carpets, upholstered furniture and pet bedding. Other less toxic choices include borate-based carpet treatments and flea traps. To prevent future flea infestations, keep your pet indoors. Restrict your pet to a regular sleeping space so you can better focus your flea control efforts. And choose and use washable pet bedding.